Dr Richard Walley (black jacket) leads the smoking ceremony proceedings on 1 October. Photo: Matthew Lau. 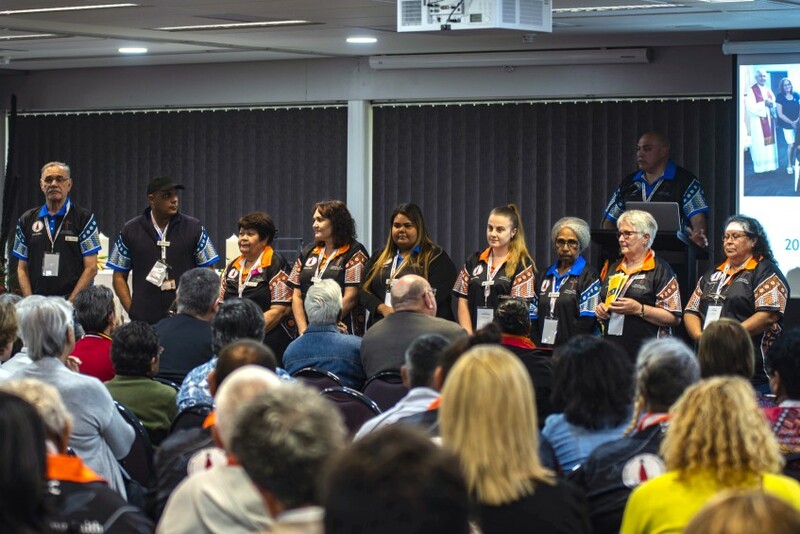 More than 300 delegates of the National Aboriginal and Torres Strait Islander Catholic Council (NATSICC) from across the country convened in Perth last week to form one body – both in Christ and in culture. The theme of “Strong Faith - Strong Youth - Strong Future” empowered the significance of the tri-annual assembly, which was held at the Technology Park Function Centre in Bentley from 1 to 5 October 2018. Plenary Council Facilitator Lana Turvey-Collins, Senator Patrick Dodson, Fr Frank Brennan SJ, Dr Richard Walley OAM, Mary Victor O’Reeri, and Tom Powell were the keynote speakers featured at this year’s conference. Dr Walley, one of Australia’s leading Aboriginal performers and writers, opened proceedings on the first day after the Welcome To Country and smoking ceremony. “The smoking ceremony is held in high esteem,” Dr Walley said. NATSICC Chairperson John Lochowiak with the 2018 assembly team. Photo: Matthew Lau. NATSICC Chairperson John Lochowiak highlighted some of the Council’s achievements since the 2015 Darwin assembly. Census data (2011 to 2016) reveals that Aboriginal and Torres Strait Islander Catholic numbers grew by seven per cent to more than 130,000 – which is a 186 per cent increase since St John Paul II’s 1986 address in Alice Springs. “We are a young and growing group in the Church,” Mr Lochowiak exclaimed. Bishops Don Sproxton, Christopher Saunders, Michael Morrissey, Eugene Hurley, Charles Gauci, Columba Macbeth-Green, and Tim Harris were present for the opening Mass on 1 October. In his homily, principal celebrant Bishop Saunders lamented the devastation around the policy of the Stolen Generations. “Although many Aboriginal people find this hard to believe, I, like so many others, knew nothing about it,” the Bishop of Broome began. 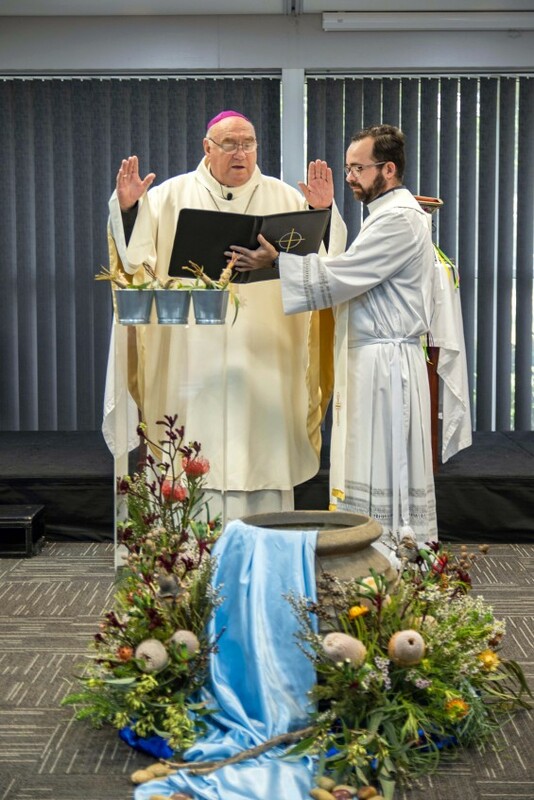 “Even though my own diocese was one of those that had been responsible for providing the facilities and the care for Aboriginal people after they had been taken away. Still, it was something not spoken about. Bishop of Broome Christopher Saunders blesses the holy water for NATSICC Assembly 2018. Photo: Matthew Lau. Bishop Saunders spoke about an image he found in diocese’s archives of some 40 Aboriginal men in the small town of Wyndham during WWI, joined together by the neck in chains. He noted his pleasure in seeing a large gathering of Aboriginal and non-Aboriginal people united at the assembly. 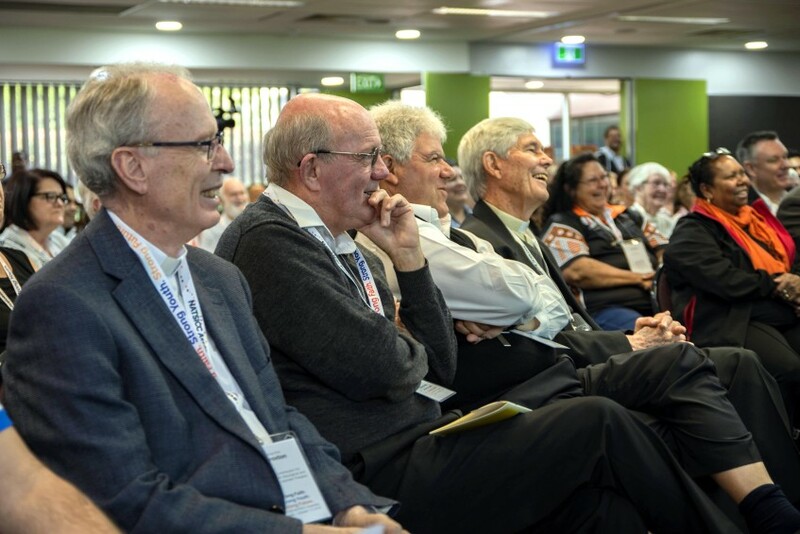 Bishops of Australia, from left: Michael Morrissey, Don Sproxton, Charles Gauci, and Eugene Hurley enjoy Dr Richard Walley’s amusing tales. Photo: Matthew Lau. Bishop Saunders said Catholics must collectively “find our way, and continue to walk that pathway to goodness and to newness of life”. “We are privileged to have this faith of ours that teaches us the error of our ways, the error of the ways of our nation, and promises us a newness of life. “God is here among us and encourages us with His presence, His love, and His grace. And does enable us, no matter all the disappointments of life, to rise above and beyond them to serve Him,” he continued. Various concurrent workshops and “yarning circles” took place during the week, with a day trip to New Norcia held on Wednesday 3 October. 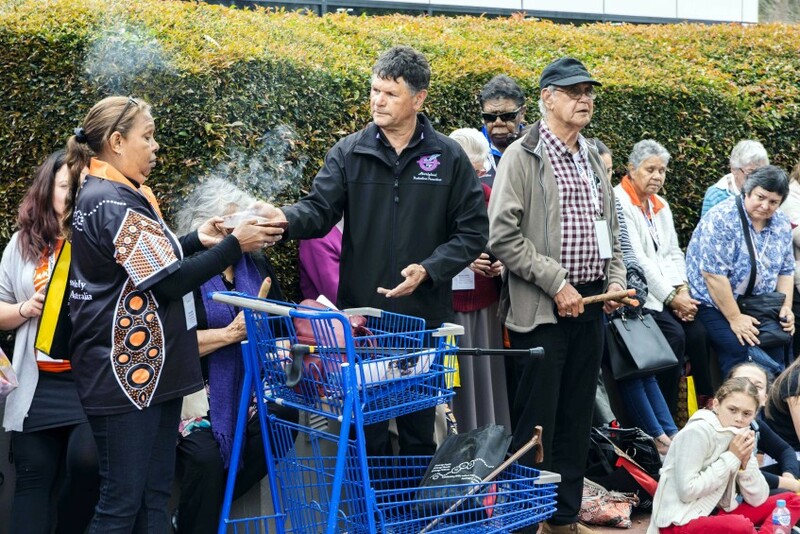 Vicky Burrows, Director of Aboriginal Catholic Ministry, said the Perth agency was grateful to host “such a wonderful event”. “A couple of Perth parishes sponsored delegates from remote parts of WA,” she said. The next NATSICC Assembly will take place in Townsville in 2021.